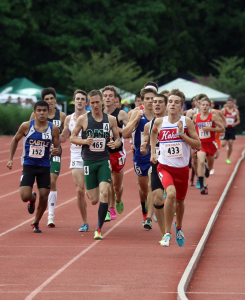 BLOOMINGTON – One year after winning championships in boys and girls track and field individual events, Howard County athletes enjoyed another solid outing at the IHSAA Track and Field State Championships, bringing home four podium finishes. With 11 student-athletes qualifying for the trip to Indiana University’s Robert C. Haugh Track and Field Complex, it was Kokomo’s Jeremy Breedlove who garnered the highest finish. The IUPUI recruit claimed a fourth place finish in the 1,600-meter run after leading at the bell. Entering with the No. 1 seed, Breedlove found himself in a tight pack for the first two laps. He broke free at the beginning of the final 400-meter lap, but knew he did not have a large enough lead to hold off eventual champion Joe Murphy of Lawrence North. Kokomo pole vaulter Avery Barrett cleared the first height and finished 16th with a final vault of 14-0. Western junior Corey Hinkle, who finished third in the state wrestling finals and was an all-state football player, continued his outstanding season with a 24th place finish in the discus. Cameron Oden of Northwestern clocked a :23.32 for 25th in the 200-meter run. And Western senior Matt Grider made his third trip to the state meet, finishing 19th in two events – the 3,200-meter run (Breedlove finished 26th) and 3,200-meter relay (joining Jacob Bradshaw, Auston Davenport and Josh Everetts). On the girls side, a pair of Northwestern Purple Tigers returned home with medals around their necks. Taryn Thor capped her high school career with an eighth place finish in the 3,200-meter run. And in her second trip to the state finals, Amber Miller stood on the podium in ninth place in the long jump. For Kokomo, freshman Lana Pham cleared the high jump at 5-4 to score a ninth place finish. He sister, Anh, made a third trip to the state meet and finished 15th in the pole vault. The senior Pham sister qualified last year but was unable to complete due to an injury. Deju Miller of Kokomo closed out the Howard County competition with a 15th place finish in the high jump. This entry was posted in IHSAA. Bookmark the permalink.